Non cliccare qui A MENO CHE NON VUOI IL MIGLIOR VALORE NELL'Utah del Sud! Questo condominio può ospitare comodamente 6 letti. (1 letto matrimoniale nella camera da letto principale con un'altra regina e letti a castello separati separati da una porta della privacy e tende) Dotato di 3 tv, cavo e un lettore dvd / bluray. Lavasciuga. Grande vasca da giardino per un po 'di relax. La cucina ha un frigorifero con un ice maker, forno a microonde, pentole, padelle, ecc. Patio con patio e sedie esterne aggiuntive. Plus Wifi GRATUITO. Chi non ama St. Giorgio? C'è qualcosa per tutti. All'aperto, al coperto, escursionista, ciclista (strada o sterrato), atv / ohv, golfista, corridore, buongustaio, 'peccatore', arti e persino sommozzatori che possono vedere l'aereo affondato a Sand Hollow. A 90 minuti da Las Vegas, a 40 minuti dal Parco Nazionale di Zion, a 10 minuti da numerosi ristoranti, negozi, teatri, musei e a pochi minuti dai fantastici servizi che lo Sports Village ha da offrire. I servizi includono: piscina olimpionica per adulti e vasca idromassaggio, piscina per bambini, piscina riscaldata tutto l'anno e seconda vasca idromassaggio. Campi da tennis, racquetball, basket e pallavolo, palestra, biliardo, calcio balilla, air hockey, ping pong, minigolf, shuffle board e altro ancora. Area di gioco dei bambini. Clubhouse con WiFi gratuito, padiglione con barbecue in bricchette. Seriamente qualcosa per tutti !! Lo amiamo qui e lo farai anche tu. 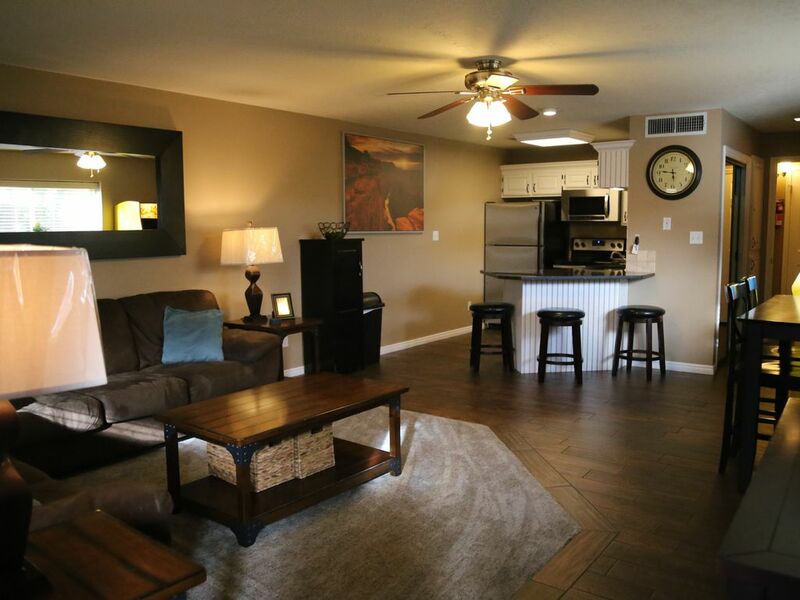 We love staying at this very clean vacation rental! My kids look forward to playing Pac-Man, and using the clubhouse and pool! We stayed here with our 3 kids the place was very nice and clean. The condo had everything we needed to cook and do laundry. The price was perfect. We even had a PAC-MAN arcade in the living room. The property was fun with lots of activities for everyone. The things we weren’t impressed with: we had a toddler with us and the playground was very run down with old rotted wood that I saw at least 3 runsty nails poking out of. In fact every piece of wood that I saw at this property was rotted, not just at the playground. We lost our sons toy car in the condo and so as we were searching for it noticed that the “clean” was only surface. Under couches and inbetween cushions had dust bunnies and crumbs. I found an old used sock under our bed. Under the arcade was disgusting which surprised me because it could be moved pretty easy. Also, there was no sponge to wash dishes. I guess for $75. A night that’s to be expected?? We gave it 4 stars because we really did enjoy our time and it really was an adorable condo. If it got a deep clean and the property got a few upgrades (all the wood replaced) we would definitely give it 5. We’re glad you enjoyed your stay and we’re sorry to hear that you weren’t 100% impressed. The HOA is updating the exterior of all the buildings, ours should be completed later this year, including new accent wood. We will pass on the information to the HOA about the playground and also remind our cleaners to take a little extra time on the areas mentioned. Hope to have you stay again soon. This condo was a very clean, cosy, comfortable place to stay. Hope to return again. We had a great time in St. George, despite the bad weather! The Condo was great except for the power going out for a few hours due to the snow! A few suggestions would be a rug inside the door to wipe your feet on when it is wet outside, having a few more large pots and pans with lids, and having some tissues would be nice. The condo was very clean, the beds and couches were comfy and the activities at Sports Village were awesome. Our family of six had a wonderful time. We loved the amenities of this entire property. Had a great time playing pickelball, racquetball, Mimi golf and swimming. The kids really loved the PAC man video game in our room! Situato nella soleggiata San Giorgio. Vicino a più parchi statali, tra cui Sand Hollow e il Parco Nazionale Zions. Vicino al teatro all'aperto Tuacahn, campi da golf, ristoranti e altro ancora! Rates are subject to change until reservation is confirmed. Rates may be higher during Holidays. Cancellation Policy: 100% refund with at least 30 days notice before arrival date. Daily maid service not included, Cleaning fee is for a one time clean after guests stay.